Peanut butter lovers rejoice! 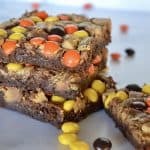 These fudge brownies are full of delicious Reese's Peanut Butter Cups, Reese's Pieces, and swirled peanut butter, and are so easy to make. Preheat oven to 350 degrees. Lightly grease a 9 x 9 inch baking pan with cooking spray and line with parchment. In a mixing bowl cream together the butter and sugar until pale in color. Beat in the eggs and vanilla to combine. Add in the flour, cocoa powder, baking powder, and salt. Mix to combine. Pour into lined baking sheet and smooth out. Dollop the peanut butter over the top of the brownie mixture. Using a toothpick or a knife, swirl the peanut butter to combine slightly with the brownie mixture. Sprinkle the Reese's Peanut Butter Cups and Reese's Pieces over top of the brownie and press down slightly. Bake for 20 minutes or until sides start to pull in from edges of pan. Cool completely on wire rack before cutting. You can make these ahead and store in the refrigerator for up a week.